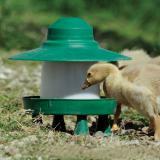 Protect your chicken feed and reduce waste by using this rain hat with the Ascot Feeder. 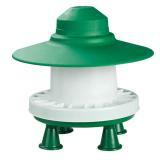 Has a secure fit to ensure that it will not blow off in windy conditions. Helps protect feed from the elements and reduces waste. 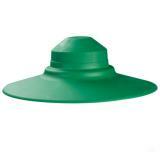 I purchased three to modify as rain hat for my bird feeders. The price is half the price and I am very happy with the look. Although I haven't had it long, it appears to function well in keeping the feed dry on rainy days. It fits very easily on the Ascot feeder; if you want to use it and hang the feeder, you will need to drill a hole top center of the rain hat - very easy.